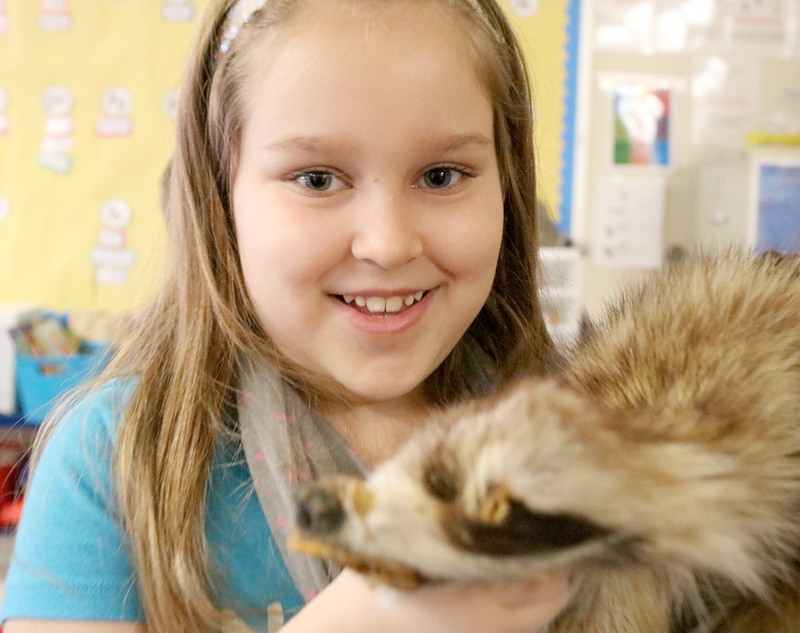 First grader Isabella Bailey experiences petting a raccoon pelt during a recent classroom visit from a 4-H educator. Lanigan Elementary first graders have left their learning footprints on a recent academic unit on animals and habitats. Students in Karrie Schremp’s, Marie Mathes’, and Samantha Finocchiaro’s classrooms showcased their research and presentation skills as they revealed animal diorama projects to their fourth grade buddies. Schremp said the students practiced public speaking skills and demonstrated their artistic abilities with the fun, hands-on project. To help the first graders hone in on their mammal facts, their teachers welcomed 4-H environmental educator Linda Brosch. Students learned about common mammals found throughout Oswego County, such as beavers whose front teeth never stop growing and weasels who are known as the most ferocious local predator for eating smaller mammals. 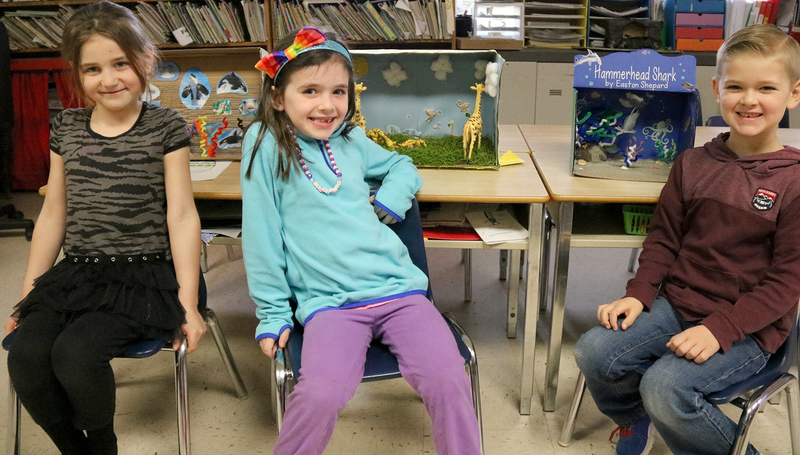 From left, Elizabeth Delaney Gabriella Ferrera and Easton Shepard show off their diorama projects from their first grade Listening and Learning unit on animals and their habitats at Lanigan Elementary School. Brosch distributed animal footprint cards so students and their families could learn the tracks of critters in their yard. She also warned the children to stay away from nocturnal animals, such as raccoons, if they are spotted in the daytime. Another activity for the first graders’ Listening and Learning unit was a writing prompt about if they could have animal teeth what would they want and why.